Toucans are a familiar bird to many people because of their colorful, generously proportioned bills. There are about 40 different species of toucans and they can be found in Southern Mexico, Central America, northern South America, and the Caribbean. The different species range in size from just a few ounces to well over a pound. Not only are their large but light bills effective for thermoregulation, they are helpful in feeding, allowing a toucan to reach more food from a stationary position. Toucans can make entertaining companions as long as they receive plenty of out of the cage time for exercise and interaction. Owners who give their toucans free reign in the house need to be aware that toucans will scoop almost any random tidbit for a snack, regardless of whether or not it’s edible – so don’t leave any screws, wires, etc. laying around. With their diet and other needs properly attended to, these charismatic birds can live for over 20 years. 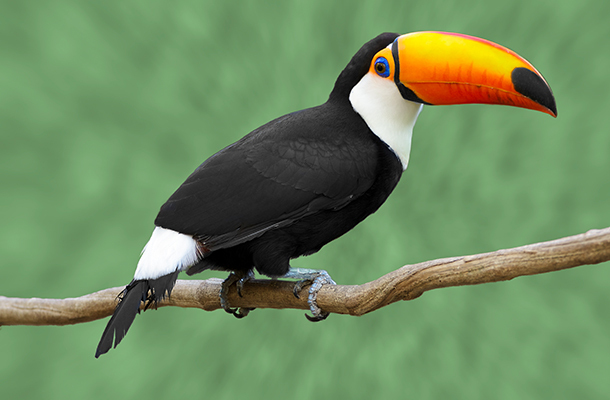 Read more about toucans here! When we talk about fast animals, the one that immediately comes to mind for most people is the cheetah, who can reach 70 mph when sprinting. But that’s not even close to the peregrine falcon’s diving speed of up to 242 mph! Flying to great heights, the peregrine falcon reaches top speed performing a maneuver called the stoop: an incredibly fast, steep angled descent designed to surprise prey and hit with incredible impact. Moving so fast isn’t easy on the lungs, but the peregrine falcon has evolved bony tubercles in its nostrils that help divert airflow way from the nostrils and better manage changes in air pressure.